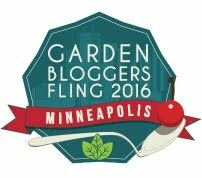 Many of us plant berry bushes, but do you specifically plant berries for the birds? Feeding the birds is a enjoyable activity, but because I have always had cats I have planted high bush cranberries, holly, and cotoneaster instead of putting up bird feeders. However, my first reason for planting these shrubs that produce autumnal berries is because they are beautiful. In addition to the plants I have deliberately put in my landscape I am lucky to have elderberries and grapes already in place. In the fall many birds are migrating. When we had Stu Watson from the Audubon Society visit our woods and fields to help us make them more bird friendly, he told us that 70 to 90 bird species breed and nest in our area. Many other bird species pass through in the spring and in the fall. Audubon wants to keep common birds common, and providing, food, shelter and water will help do that. I realized there was a very good reason to plant berries for the birds. I like thinking that our land provides safe and supportive space for birds, even if their needs were not uppermost in my mind when I did my first plantings. One of the first ornamental shrubs I planted was the highbush cranberry, Viburnam trilobum. I was not thinking of the pretty berries it produces in particular, but only of the flat lacey spring flowers made up of fertile and sterile flowerets. That shrub has now reached a height of about 12 feet or more, and a pretty considerable spread. 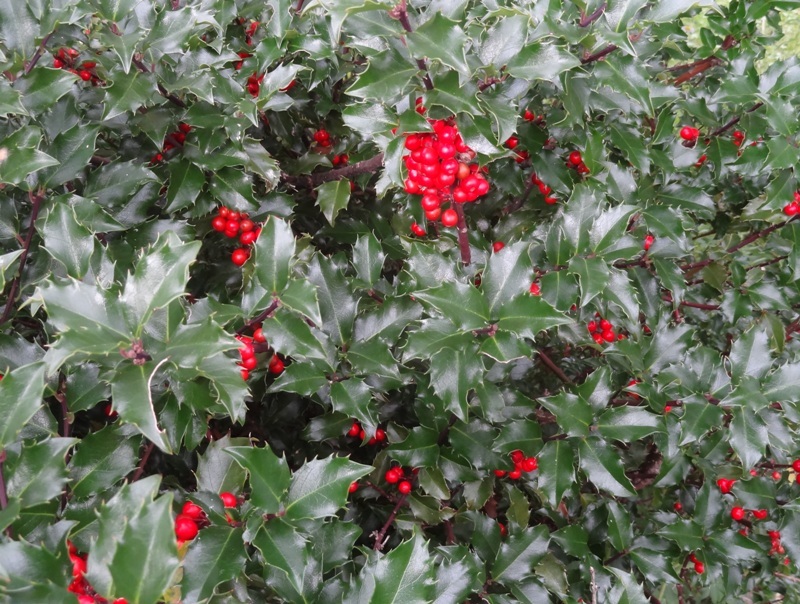 Right now it is laden with clusters of beautiful red berries. They are not cranberries at all, but they are edible though my husband might ask me if they are palatable. We don’t actually have any interest in eating them ourselves. They are very sour, but the birds like them especially in the spring when protein rich tree pollen is available as a side dish to help metabolize the berries. 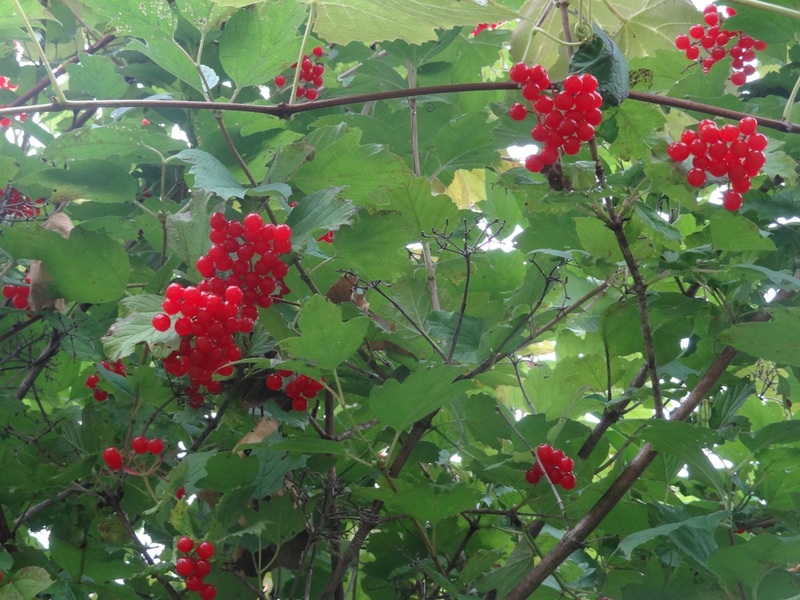 My highbush cranberry also supports a wild Concord grapevine. This vine was here when we bought our house and we hack it back when we have time, but we will never conquer it. Still, these grapes are another source of food. People who are growing grapes for their own consumption have to find ways to protect them from the birds. The mountain ash, Sorbus americana is native to the United States and is a popular landscape tree. It can reach a height of 30 feet. It produces white flowers in the spring and bears brilliant red-orange berries in the fall. It also has good fall color with foliage turning shades of gold, orange, and even a dark red/maroon. The berries attract thrushes and waxwings. Another tree that is said to attract cardinals, finches, robins, blue jays, and waxwings in particular is the mulberry. Mulberries are also edible and many people eat them out of hand or make jam. The birds just gobble them up. The one downside to mulberries is that the juice can really stain, which means that they should not be planted near walkways or anywhere people might congregate. No tea parties under the mulberry. Mulberries have also been called ‘protector trees’ because birds like the berries so much that they gorge themselves on the mulberries and leave cherries and other crops alone. The native red mulberries, Morus rubra, are hardier than the black variety. One of the most showstopping shrubs is Callicarpa dichotoma, or beautyberry. This is a small shrub that will grow between two and four feet with about an equal spread. There are small pink flowers in the summer, but in the fall it produces clusters of berries in the most amazing shade of purple. When I first saw this shrub growing on the Bridge of Flowers I thought they must be artificial. The birds have no such thoughts and find them delicious. 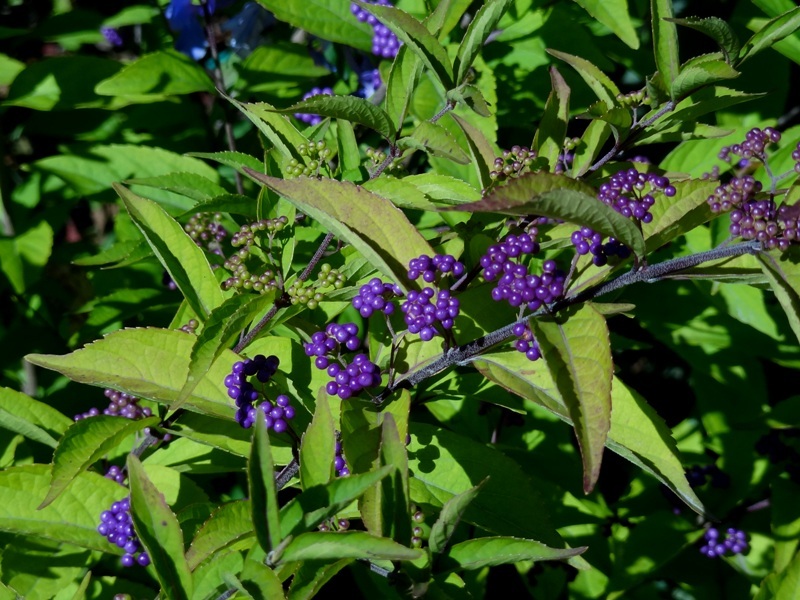 Beautyberry is deciduous and hardy to zone 5. It likes full sun but can tolerate part shade. I cannot grow this in Heath, and I think even if I lived in Greenfield I might find a fairly sheltered spot for it. It is a carefree plant with no serious diseases. I don’t know if I was the last person to know how to pronounce cotoneaster (co-toe-knee-aster NOT cotton-easter) but even before I could pronounce it I knew it was a good groundcover. While I was learning how to pronounce it I also learned that I had one variety (name lost) that produced coral-red flowers in the spring looking very much like ornamental quince flowers. I also learned that birds love the red berries that appear in the fall. I planted two different cotoneasters too near each other. That is what happens when you are too eager to cover ground. They now grow into each other which fortunately is not unattractive. One hugs the ground and one is a bit more mounding. Both have tiny lustrous dark green leaves. They are undemanding, but in my garden they did take a couple of years to really start spreading. I may be showing my impatience again. 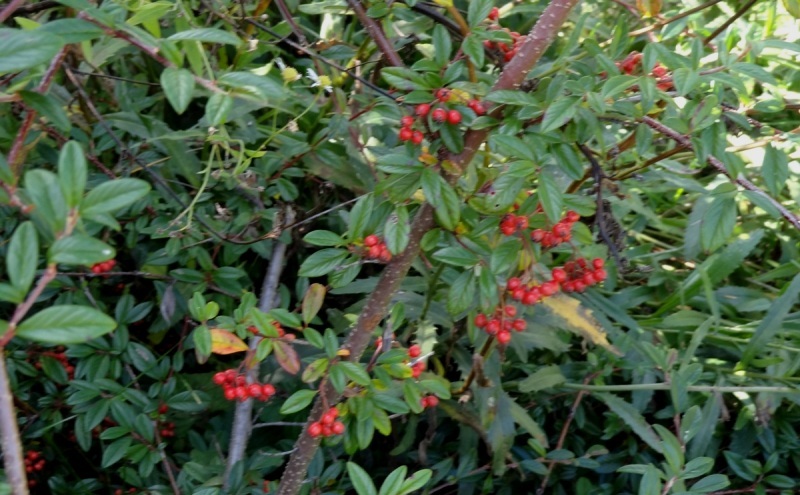 Cotoneasters can grow in full sun or part shade. It is important that the soil be well drained. Established plants can tolerate drought. Happily for me, neither deer nor rabbits show any interest, allowing the birds to make full use of the little red autumn berries. I also planted Blue Prince and Blue Princess holly bushes. Hollies need male and female plants to fruit. It is not yet Christmas but my Blue Princess is having a productive year. Lots of beautiful berries. The birds like them, but they will leave some for my holiday decorations. I have many of these same shrubs. The high bush cranberry never has berries this time of year because the birds never leave them much past the time they ripen. We have had a mulberry across the street from us for 30+ years . It was taken down this year. I wish I had a seedling in the garden now. I have pulled many out but now that I need one Ic an’t find one. Isn’t that the way it always happens? It is too hot and dry here for the mountain ash. I have tried it a couple of times. It think it is the prettiest little tree. Great post for the birds.